Figure 1. The canary yellow diamonds from this study showed much lower concentrations of isolated nitrogen than regular type Ib yellow diamonds, which usually show brownish and greenish hues linked to plastic deformation. Photo by Sood Oil (Judy) Chia. 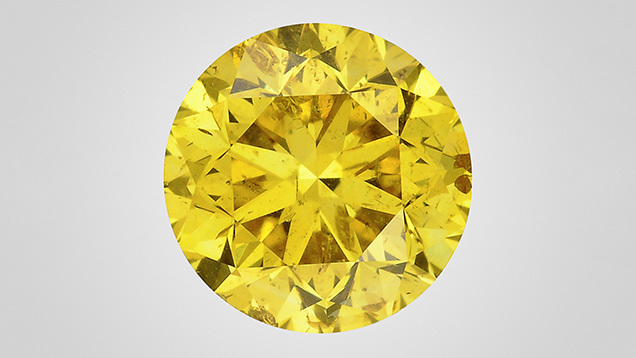 Isolated nitrogen is one of the major defects in producing yellow color in natural diamonds. In regular type Ib yellow diamonds, isolated nitrogen is normally the dominant form, with limited aggregations in A centers (nitrogen pairs). Type Ib diamonds normally experienced strong plastic deformations. In addition to vacancy clusters, many other optic centers were introduced during annealing over their long geological history, such as GR1, NV, and H3 centers. Diamonds from the Zimmi area of West Africa are a typical example (Smit et al., 2016). As a result, clear brownish and greenish hues are common among these diamonds, so most do not possess true “canary” yellow color. Here we studied more than 2,000 diamonds with real canary yellow color. Their color origin and relationship with type Ib diamonds were explored. Sizes of the studied diamonds ranged from 0.01 to about 1.0 ct. They showed pure yellow color, with grades of Fancy Intense or Fancy Vivid yellow. Infrared absorption analysis showed that they were all type IaA with very high nitrogen concentrations, but a very weak absorption from isolated nitrogen at 1344 cm–1 was detected in all samples. Concentration of isolated nitrogen was estimated at ~2–3 ppm. This isolated nitrogen created smooth absorption in the ultraviolet-visible (UV-Vis) region, increasing gradually to the high-energy side. No other defects were detected using UV-Vis absorption spectroscopy, which explained the pure yellow color we observed. Fluorescence imaging revealed multiple nucleation centers with dominant green color, which was attributed to the S3 defects confirmed through photoluminescence analysis. Compared with natural type Ib diamonds, an outstanding feature of the studied samples is the absence of plastic deformation. For this reason, other vacancy-related defects were not introduced to these diamond lattices over the geological period after their formation. Sulfide inclusions are common in type Ib diamonds, but they were not observed in these canary stones. Instead, some calcite inclusions were observed. All the observations from this study indicated that the canary diamond samples were formed in a different geological environment than type Ib diamonds. The dream of growing synthetic diamonds existed for many centuries before it was achieved in the 1950s. The development of techniques to identify synthetic diamonds and enable their reliable separation from natural diamonds has not had the luxury of centuries to work with. Since the early reports on the characteristics of laboratory-grown stones, scientists have been working steadily to establish and improve the means of detection. For many years the De Beers Group has been developing equipment for rapidly screening and testing for potential synthetic and treated diamonds as part of a strategy aimed at maintaining consumer confidence in natural untreated diamonds. This work has been underpinned by extensive research into defects in natural and synthetic diamond, either conducted within De Beers’ own facilities or through financial and practical support of research in external institutions. Key to any detection technique for synthetic diamonds is a fundamental understanding of the differences between them and natural diamonds. This could take the form of differences in the atomic impurity centers or differences in the spatial distributions of these centers brought about by very significant distinctions in the growth environments. The former was used in the development of the DiamondSure instrument that, among other things, detects variance differences in the absorption spectra due to the presence or absence of the N3 feature. This absorption is from a nitrogen-related defect that is usually only produced in nitrogen-containing diamonds by extended periods at relatively high temperatures—that is, conditions generally experienced by natural diamonds. Growth-related differences in impurity distributions can be very accurately imaged using the DiamondView instrument. Short-wave ultraviolet (UV) light is used to excite luminescence from a very thin layer of diamond near the surface to give images free from the blurring encountered with more common longer-wavelength excitation sources. DiamondView has, since its launch, provided the benchmark for the detection of synthetic diamonds. A number of approaches involving absorption features have been developed, including the use of almost complete absorption in the ultraviolet region of the spectrum to indicate that a diamond is not synthetic. The UV absorption is produced by the A center (two adjacent nitrogen atoms) and is rarely encountered in as-grown synthetic diamonds. The main form of nitrogen in synthetic diamonds is a single substitutional nitrogen atom that absorbs in both the ultraviolet and visible regions to produce yellow color. The combination of UV absorption and no strong yellow color is therefore restricted to natural diamond. However, treatment of nitrogen-containing synthetic diamonds is capable of generating A centers, but generally does not produce a colorless stone. This effect accounts for the careful color ranges often applied to instruments relying on UV absorption for screening. This also highlights one of the limitations of absorption spectroscopy: When smaller stones are tested, the amount of absorption decreases and the technique becomes less reliable. In recent years we have seen a shift to smaller sizes (below 0.01 ct) in the synthetic diamonds being offered for sale to the jewelry market, and screening techniques have had to evolve to address this situation and the limitations of absorption-based approaches. Testing melee-sized diamonds, as well as introducing technical challenges around the measurement technique, has also led to the introduction of greater automation. In 2014 the De Beers Group introduced the first automated melee screening instrument (AMS1), which combined the measurement technique from DiamondSure with automated feeding and dispensing of stones in the range of 0.20 to 0.01 ct. While this instrument was well received and effectively addressed concerns around synthetic melee-sized stones in the trade at the time, there soon came calls for improvements—a faster instrument capable of measuring smaller stones, no restrictions on cut, and a lower referral rate for natural diamonds. These requirements proved impossible to meet with the limitations imposed by absorption measurements, and a new technique based on time-resolved spectroscopy was developed. This resulted in the AMS2 instrument, launched in March 2017. The AMS2 processes stones at a speed of one stone per second, 10 times faster than the AMS1. It measures round brilliants down to 0.003 ct (0.9 mm dia­meter) and can be used on other cuts for stones of 0.01 ct and above. The measurement technique itself has been incorporated into the SYNTHdetect (figure 1, left), an instrument launched in September 2017 that allows manual observation of the time-resolved emission. Besides providing the same testing capability as AMS2 (figure 1, right) for loose stones, various holders allow testing of mounted stones in a wide range of configurations. The benefit of this approach is that stones tested loose using AMS2 will generate a broadly consistent result when mounted on SYNTHdetect. Figure 1. The De Beers Group instruments SYNTHdetect (left) and AMS2 (right) provide screening capability for melee-size diamonds as small as 0.3 points. Photo courtesy of Danny Bowler © De Beers Group. Changes in growth processes for synthetic diamonds have also led to the gradual introduction of new characteristics. High-pressure, high-temperature (HPHT) synthetics have tended to be fairly consistent in their growth-related luminescence patterns, while significant variations in the features associated with chemical vapor deposition (CVD) synthetics have been observed. These continue to be well documented and have led to the gradual evolution of the DiamondView instrument and the way in which it is used. Post-growth treatment of synthetic diamonds can be applied for a number of reasons: improvement in the color, modification of the atomic defects to make the stones look more like a natural diamond, and removal of a characteristic that could be used to identify a synthetic diamond. The motivation for the latter two treatments can only be described as fraudulent. The challenge in developing detection instruments and techniques is to ensure that they are as robust as possible in the face of such challenges. Treatment techniques will rarely have any effect on the growth patterns associated with synthetic diamonds, and it is therefore very difficult to treat synthetics in a way that would make them undetectable using the DiamondView. Screening instruments tend to be based on a single technique, and it is important that the approach adopted not be vulnerable to simpler forms of treatment. This has been of primary concern to the De Beers Group in the development of our own screening instruments. It has also been necessary in certain cases to withhold detailed information about detection techniques where disclosure of this would lead to undermining of the detection technique itself. The De Beers Group continues to invest heavily in growth and treatment research in order to develop the next generation of instruments and techniques that will assist the trade in maintaining detection capability to support consumer confidence. The Group is uniquely placed in the industry to address these challenges due to its collaboration with Element Six (world leaders in synthesis of diamond for industrial and technical applications) and its in-depth knowledge of the properties of natural diamonds with known provenance from its own mines. Diamond, known for its splendor in exquisite jewelry, has been synthesized since the 1950s. In the last six decades, the perfection of laboratory-grown single-crystal diamond has vastly improved through the research and development of two main synthesis techniques. One replicates Earth’s natural process, where the diamond is grown in the laboratory under conditions of diamond stability at high temperature and high pressure (HPHT). The other technique relies on the dissociation of methane (or other carbon-containing source gas) and hydrogen and the subsequent deposition of diamond at low pressures from the gaseous phase in a process known as chemical vapor deposition (CVD). In the latter case, diamond is not the stable form of carbon, but the kinetics in the CVD process are such that diamond wins out. Large gem-quality synthetic diamonds are now possible, and a 6 ct CVD (2018) and a 15.32 ct HPHT (2018) have been reported. It is of course possible to differentiate laboratory-grown from natural diamond based on how extended and point defects are incorporated into the crystal. Furthermore, treated diamond can be identified utilizing knowledge of how defects are produced and how they migrate and aggregate in both natural and synthetic diamond samples. Room-temperature confocal photoluminescence microscopy can be used to image the emission of light from defects in diamond with a spatial resolution limited only by the diffraction limit; a lateral spatial resolution approaching 300 nm is routinely achieved (figure 1). It is possible with this tool to identify point defects with concentrations less than 1 part per trillion (1011 cm–3). Figure 1. Left: DiamondView fluorescence imaging shows dislocation networks in a natural type IIa diamond. Right: A room-temperature confocal photoluminescence image taken with 488 nm excitation shows H3 defects following a dislocation network pattern within the diamond. Some of the fluorescent spots are single H3 centers. This talk will outline the experimental setup, how this tool has been used to identify the decoration of dislocations with point defects in CVD lab-grown diamond, and how different mechanisms for defect incorporation operate at growth sector boundaries in HPHT synthetic diamond. The effect of fluorescence on the appearance of diamonds has been a subject of debate for many years (Moses et al., 1997). In the trade, fluorescence is generally perceived as an undesirable characteristic. Nearly 80% of diamonds graded at HRD Antwerp receive a “nil” fluorescence grade, while the remainder are graded as “slight,” “medium,” and “strong,” their value decreasing with level of fluorescence. To understand how fluorescence might change diamond appearance, a selection of 160 round brilliant-cut diamonds were investigated in detail. This study focused on the effect of fluorescence on diamond color. The aim was to determine under what lighting conditions the color of a diamond could change and the magnitude of that effect. We also investigated a smaller selection of diamonds with multiple spectroscopic absorption techniques to study the origin of their fluorescence. The lighting arrangement we used combined the UV from light-emitting diode (LED) lamps with the light from a daylight-equivalent (grading) fluorescent lamp that had its UV component filtered out. With controlled UV output and after calibrations, it was possible to simulate different illuminations, including outdoors, indoors near a window, office lighting, and grading environments. The grading environment provided the reference color. Diamonds were presented in both table-down and table-up orientations, with the degree of effect determined by visual comparison with nonfluorescent master stones. For each color, both experienced diamond graders and nonprofessionals examined the possible effect of fluorescence on color appearance. It was found that the UV level in office lighting was insignificant and did not produce any observable effect even with “very strong” fluorescence. However, with daylight from either outdoors or indoors, near a window, the relative strength of UV was significant, sufficient to create a positive color change. For samples with a “very strong” fluorescence, the results are shown in figure 1. For each color, ranging from D to J, the color shift caused by exposure to different UV levels—represented by the different lighting conditions—is illustrated. Figure 1. For samples with “very strong” fluorescence, the observed color in different lighting conditions (outdoor, indoor, and office) is shown. These samples were graded through the pavilion (table-down). Note that in an outdoor environment, J colors can appear as D colors. Photoluminescence (PL) and phosphorescence underpin many of the discrimination techniques used to separate natural from synthetic diamond. PL is at the heart of many new quantum technologies based on color centers in lab-grown diamonds. In HPHT synthetic diamond, the phosphorescence observed is explained in terms of donor-acceptor pair recombination. The thermal activation of electrons to neutral boron acceptors shows that boron plays a key role in the phosphorescence process. However, there are a number of things we struggle to explain. For example, the phosphorescence peak positions are not fully explained, and there is no conclusive link between the emission and charge transfer involving the substitutional nitrogen donor. Secondly, the origin of the phosphorescence observed in some synthetic diamond samples grown by the CVD process is unclear. Although we now have evidence for unintentional boron impurity incorporation at stop-start growth boundaries in some CVD synthetic samples, it is possible that some of the observed phosphorescence does not involve boron impurities. In this paper we report on the results of combined fluorescence, phosphorescence, thermoluminescence, and quantitative charge transfer investigations undertaken on both HPHT and CVD synthetic diamond, with the objective of identifying which defects are involved in the fluorescence and phosphorescence processes. Pink diamond is extremely popular among fancy-color diamonds, which has prompted numerous attempts to produce pink diamond artificially. Pink CVD synthetic diamonds appeared on the gem market around 2010. Their color was produced by a multistep process combining post-growth HPHT treatment to remove the brown hue and subsequent electron irradiation, followed by low-temperature annealing. Pink CVD synthetic diamonds treated only with low pressure and high temperature (LPHT), without additional post-growth irradiation, have also been reported but are rarely seen on the market. 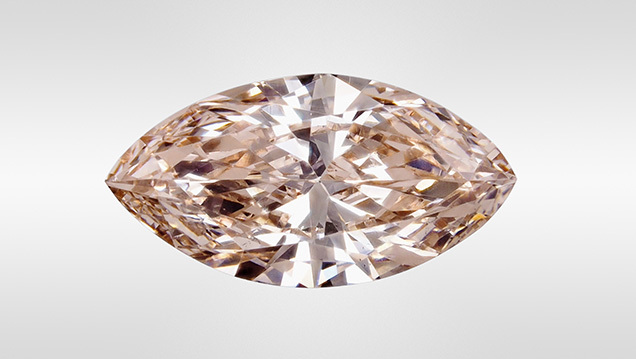 Recently, a loose pink stone (figure 1) was submitted to the Central Gem Laboratory in Tokyo for grading purposes. Our examination revealed that this 0.192 ct brilliant-cut marquise was a CVD synthetic diamond that had been LPHT treated. Figure 1. LPHT-treated brownish pink CVD synthetic diamond weighing 0.192 ct. Photo by Hiroshi Kitawaki. However, irradiation-related peaks such as at 1450 cm–1 (H1a), 741.1 nm (GR1), 594.3 nm, or 393.5 nm (ND1) that are seen in the pink CVD diamonds treated with common multi-step processes were not detected. The 3123 cm–1 peak presumably derived from NVH0 disappears after a normal HPHT treatment. The 2901, 2870, and 2812 cm–1 peaks are known to shift toward higher wavenumbers as the annealing temperature rises. Our own HPHT treatment experiments on CVD-grown diamonds proved that the 2902 and 2871 cm–1 peaks detected after 1600°C annealing shifted to 2907 and 2873 cm–1 after 2300°C annealing. The peak shift of 2901, 2870, and 2812 cm–1 is also related to the pressure during the annealing, as these peaks shifted to 2902, 2871, and 2819 cm–1 at the higher pressure of 7 GPa compared to 2900, 2868, and 2813 cm–1 at the ambient pressure under the same annealing temperature of 1600°C. Absorption peaks at 7917 and 7804 cm–1 in the infrared region and at 667 and 684 nm in the visible range were also detected, which coincide with the features seen in LPHT-treated stones. From the combination of the intensity ratios of optical centers such as H3 and NV centers that were detected with PL measurement, this sample is presumed to have been treated with LPHT annealing at about 1500–1700°C as a post-growth process. In recent years, CVD synthetic diamonds have been produced in a wider range of colors due to progress in the crystal growth techniques and post-growth treatments. 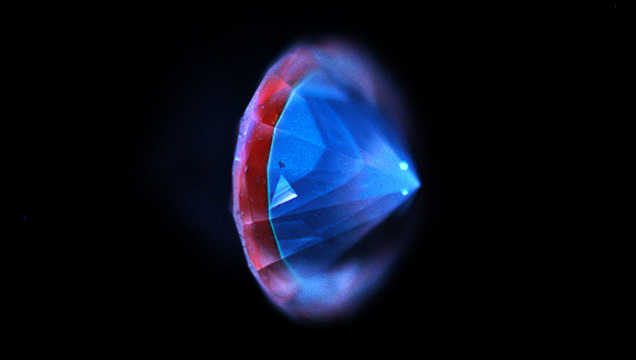 Although HPHT treatment has been employed mainly to improve the color in a diamond, LPHT annealing may become widespread as the technique is further developed. Gemologists need to have deep knowledge about the optical defects in such LPHT-treated specimens. China is the world’s largest producer of HPHT-grown industrial diamonds. Its 2016 production of about 20 billion carats accounted for 98% of the global supply. Since the beginning of 2015, melee-sized colorless HPHT synthetic diamonds have been tested at the National Gemstone Testing Center’s (NGTC) Shenzhen and Beijing laboratories in parcels submitted by different clients, which means that colorless HPHT synthetic diamonds have entered the Chinese jewelry market and may be mistaken for natural diamonds. CVD synthesis technology has grown rapidly in recent years. Large colorless and colored (blue, pink) CVD-grown diamonds have been entering the market, and a few have been fraudulently sold as natural diamonds. China has independently developed gem-grade HPHT synthetic diamond production technology since 2002, and can grow gem-grade type Ib, IIa, and IIb and high-nitrogen-content synthetic diamonds in volume, depending on market needs. Gem-grade type Ib, IIa, and IIb HPHT synthetic diamonds have been grown using the temperature gradient method, under a cubic press at high pressure (e.g., 5.4 GPa) and high temperature (1300–1600°C). Driven by a specific temperature gradient, the carbon source from high-purity graphite (>99.9%) located at the high-temperature zone can diffuse into the seed crystals in the cubic press, resulting in the crystallization of synthetic diamonds. Chinese production of melee-sized colorless to near-colorless HPHT synthetic diamonds accounts for about 90% of the global output. Gem-grade type IIa and IIb CVD synthetic diamonds are grown using the microwave plasma chemical vapor deposition (MPCVD) and direct current (DC) arc plasma methods. Faceted colorless CVD diamonds can be grown in sizes up to 6 ct by at least two Chinese companies (table 1). 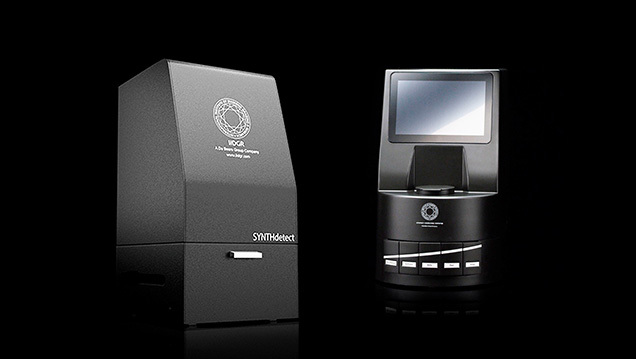 After testing and analyzing thousands of natural and synthetic diamonds collected directly from the Chinese companies, NGTC independently developed the GV5000, PL5000, DS5000, and ADD6000 instruments for rapidly screening and identifying the diamonds based on the gemological characteristics obtained. Besides HPHT and CVD synthetic diamonds, a thickly layered hybrid diamond consisting of both natural and CVD material was identified at the NGTC Beijing laboratory (figure 1). The identification features and properties of regrown CVD synthetic diamonds using natural type Ia diamond crystals as seeds will be reported. Figure 1. 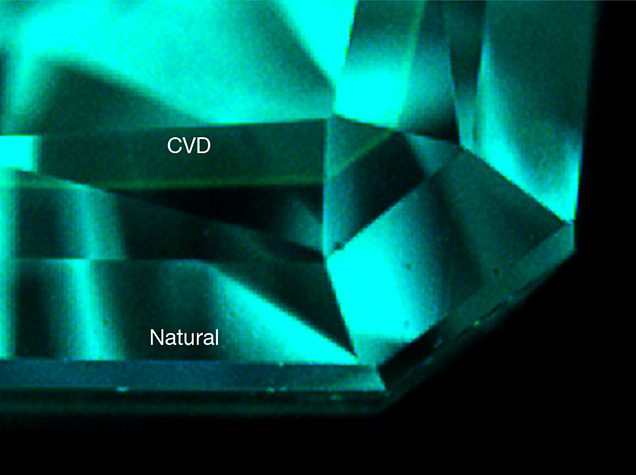 DiamondView fluorescence image of the hybrid natural and CVD-grown diamond. Photo by Shi Tang. The current status and features of colored stones examined at NGTC laboratories, including several cases studies, will be discussed. While chemical vapor deposition (CVD) diamond growth technology has progressed significantly in recent years, with improvements in crystal size and quality, the use of these goods in the jewelry trade is still limited. Not all CVD-grown gem diamonds are submitted to GIA for grading reports, and they only account for about 0.01% of GIA’s annual diamond intake (both D–Z equivalents and fancy color; Eaton-Magaña and Shigley, 2016). The CVD process involves diamond growth at moderate temperatures (700–1300°C) but very low pressures of less than 1 atmosphere in a vacuum chamber (e.g., Angus and Hayman, 1988; Nad et al., 2015). This presentation summarizes the quality factors and other characteristics of the CVD-grown material submitted to GIA (e.g., figure 1) and discusses new research and products. Figure 1. Spectra and fluorescence images of all D–N equivalent CVD-grown diamonds seen at GIA from 2007 to 2018 were analyzed. The vast majority (74%) show features consistent with post-growth HPHT treatment. The percentage of as-grown CVD products increases as the equivalent color progresses from the colorless range (D–F) to near-colorless (G–J) to faint brown (K–N). Today the CVD process is used to produce high-color (as well as fancy-color) and high-clarity type II diamonds up to several carats in size. The majority of the CVD material seen at GIA consists of near-colorless (G–N equivalent) with colorless (D–F equivalent) and various “pink” hues. Additionally, CVD material is constantly setting new size milestones, with the announcement of an approximately 6 ct round brilliant earlier this year (Davis, 2018). However, the attainable sizes among CVD products are dwarfed by those from the HPHT process, with 15.32 ct as the current record for a faceted gem (Ardon and Eaton-Magaña, 2018). One particular challenge for gemologists (albeit very rarely encountered) comes from the lab-grown/natural hybrids (figure 2) that have been submitted to and documented by gemological laboratories (e.g., Moe et al., 2017; Tang et al., 2018). In these specimens, the grower places a natural diamond into the CVD reactor as the seed plate, with both components retained in the faceted gem. If the manufacturer is using a colorless natural type Ia diamond as a seed plate for near-colorless CVD growth, the hybrid cannot undergo any post-growth HPHT treatment, as this would radically alter the natural seed by turning the natural diamond yellow. If the manufacturer is creating a CVD overgrowth layer on a faceted natural diamond, the intent is to either add weight to a diamond that may be near a weight boundary or to achieve a color change, typically to blue. These hybrid products also make it more difficult to infer a diamond’s history based solely on its diamond type. Figure 2. This 0.33 ct CVD-grown/natural diamond composite with a color equivalent to Fancy blue was previously described (Moe et al., 2017). DiamondView illumination clearly shows the interface between the lab-grown and natural components. The CVD process has also created some unique gems that have not been duplicated among natural, treated, or HPHT-grown diamonds. These include CVD-grown diamonds with a high concentration of silicon impurities, which create a pink to blue color shift. In those samples, a temporary effect was activated by UV exposure, which precipitated a charge transfer between negative and neutral silicon-vacancy centers (D’Haenens-Johansson et al., 2015). Also recently seen are type IIb CVD goods. Some that were submitted by clients had a low boron concentration (3 ppb, with G-equivalent color and 1.05 carat weight). Meanwhile, some research samples produced by a manufacturer in China and fashioned as flat plates had dark bluish coloration and very high boron concentration (2500 ppb and higher). Also among that suite of flat-plate CVD samples was one with a black color caused by extremely high amounts of nitrogen-vacancy centers. Although new CVD products are continually being manufactured and introduced to the trade, the laboratory-grown diamonds examined to date by GIA can be readily identified. Angus J.C., Hayman C.C. (1988) Low-pressure, metastable growth of diamond and diamondlike phases. Science, Vol. 241, No. 4868, pp. 913–921. Ardon T., Eaton-Magaña S.C. (2018) Lab Notes: 15 carat HPHT synthetic diamond. G&G, Vol. 54, No. 2, pp. 217–218. D’Haenens-Johansson U.F.S., Ardon T., Wang W. (2015) CVD synthetic gem diamonds with high silicon-vacancy concentrations. Conference on New Diamond and Nano Carbons, May 2015, Shizuoka, Japan. Moe K.S., Johnson P., D’Haenens-Johansson U.F.S., Wang W. (2017) Lab Notes: A CVD synthetic diamond overgrowth on a natural diamond. G&G, Vol. 53, No. 2, pp. 237–239. Tang S., Su J., Lu T., Ma Y., Ke J., Song Z., Zhang J., Liu H. (2018) A thick overgrowth of CVD synthetic diamond on a natural diamond. Journal of Gemmology, Vol. 36, No. 2. pp. 237–239.